Gorge walking at How Stean Gorge is an exhilarating experience. You enter the gorge by abseiling directly from the bridge above then forge your way against the flow of water as you scramble over boulders, slide down waterspouts, sit under waterfalls and jump into deep plunge pools.You’ll be guided along the way by our expert instructors, who’ll make sure you don’t get carried away downstream! What is Gorge Walking / Ghyll Scrambling? Gorges, canyons, ghylls and ravines are all valleys with a stream or a river running through. They’re mostly found in mountainous regions, or areas where geographical features allow the formation – such as the limestone at How Stean Gorge, Yorkshire. Gorge Walking is the process of traversing the valley via foot, this can be tricky due to the running water and steep rock formations on either side of gorges. Gorge Walking is a great way of experiencing these natural wonders as you walk through the rivers and caves which sit at the bottom. There is a small distinction between gorge walking and ghyll scrambling – gorge walking is where there is no bank either side of the water (so the only way is through the water) whereas ghyll scrambling has a small bank either side for easier exits. Read our blog post to find out more! Make sure to have a look at the tabs below for the itinerary, what to wear and FAQs. When gorge walking or ghyll scrambling at How Stean Gorge, we provide you with a purpose-made wetsuits which are the best on the market. You will also receive neoprene socks, gloves (in the colder months). Those who want to watch can see the abseiling part of the gorge from our spacious indoor viewing area then wait in our cafe or follow on some of the footpaths. We enter the gorge by abseiling 45 ft from the bridge over the gorge. Once at the bottom your guide will then show you the way – jump, slide, swim and climb your way as you ascend and descend the gorge. During Gorge Walking & Ghyll Scrambling you can ascend and descend the area through the water itself. Compare this with canyoning, where you start at the top of the chosen venue and descend using abseiling and ropework techniques. If you’ve been Gorge Walking or Ghyll Scrambling with us before and are ready for a new challenge, try your hand at canyoning! 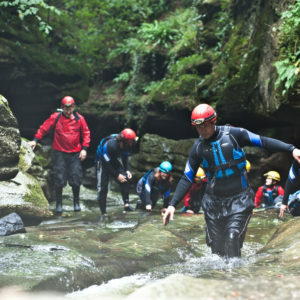 Gorge walking & ghyll scrambling is best enjoyed with family, friends or colleagues group activity. Everyone is out of their comfort zone, and everyone helps each other along the way. What’s special about How Stean Gorge? How Stean is a steep ravine, where the steep sides drop directly into the water especially the upper reaches. Formed by limestone erosion over centuries, How Stean Gorge is a Site of Special Scientific Interest (SSSI). This means the only way to follow the gorge is to proceed through the water. Even in dry spells we have water all year around, so the only way through is to swim. When you have finished we have eleven Hot showers available and our own Licenced Cafe on site. During each gorge walking session, the instructors film your group with headcams so you can experience your success (or the tricky bits!) again and again. This 3 hour experience costs £45 per person with sessions starting at 09.30 am and 2pm daily. We run sessions on Friday and Saturday evenings for groups of 10, from 6pm – 9pm at a special price of £400. Please arrive approximately 30 mins before your start time to complete medical forms. Remember everything is optional, if you don’t feel comfortable our instructors will support you. We want you to get the most out your experience and go home with a massive smile on your face. You will need to have a basic fitness level to participate in this activity, as we class gorge walking as a beginner level activity but can be tailored for those wanting something a bit more extreme. 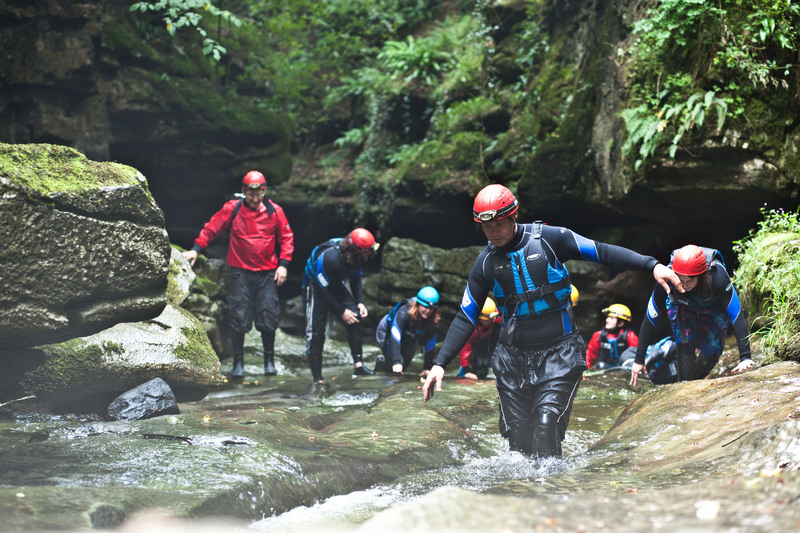 You will be safely cared for by our professional experienced instructors who use How Stean Gorge for gorge walking / ghyll scrambling on a daily basis. The location and facilities are second to none. No getting changed on the side of a road or carpark or walking miles to the venue. We have a well stock equipment store with changing rooms, hot showers and cafe just meters away from many of our activities. How Stean Gorge is a spectacular limestone ravine carved out over thousands of years by waterflow and is the perfect location for outdoor activities like gorge walking. It is geographically unique, as it’s one of the only places in the UK where you can comfortably enjoy both rock sports and canoeing in a single day. It is also a Site of Special Scientific Interest in Nidderdale, An Area of Outstanding Natural Beauty – why choose anywhere else? Those who do not take part can watch from the bridge and then while away the rest of the time exploring the gorge and caves tourist attraction or enjoying refreshments in our onsite cafe. Children will be well occupied in our play area right next to the cafe. All groups, families and individuals are welcome for this abseiling & gorge walking session. No minimum number to book, just make sure you book in advance. This is a firm favourite with Stag and Hen Dos and corporate days. At How Stean Gorge – you’ll meet the instructors in the reception area. The postcode for your satnav is HG3 5SY. When gorge walking you will need a swimming costume or trunks/shorts to wear underneath the wetsuit. We recommend you wear trainers or boots but don’t forget to bring dry footwear for when you have finished. We supply all safety equipment. You are welcome to use our hot showers and changing area afterwards so don’t forget a towel.